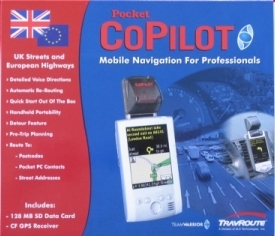 Travroute is a well established company in the GPS arena and they have previously had several versions of Navigation software available both for the PC and Pocket PC, and last year with an alliance with TeamWarrior in the UK, brought the Compaq iNS (iPAQ Navigation System) to both Compaq and the UK GPS users. In the past year, Travroute have been working very hard trying to better the current offering both from a hardware aspect and also to better the current software offering that was available in the Compaq iNS. 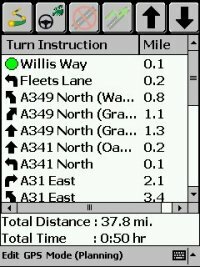 Well, when you take a look at CoPilot 3.5UK, you'll see that they have done just that, and for all you Compaq iNS users out there, you'll be pleased to see some of the new and enhanced features, and for those who haven't had the experience of Compaq iNS or CoPilot, then there are some features that will just make you want to drewl! One thing we all find ourselves doing is ripping open the packaging, grabbing the CD, inserting it into our CD Rom drive, and then waiting whilst it takes forever to install a full GPS software package with country wide maps. This probably is the most depressing part of buying new GPS systems, and it's usually when I take time to chill out and grab a coffee. Thankfully Travroute have found this themselves and have not only included the CD, but they have included a 128mb CF/SD card depending on the package you purchase. This comes pre-installed with their complete software and maps. Once you've taken this out of the packaging, you simply insert it into the Pocket PC, it will start auto-installing the software, and literally in a few seconds all is complete. No need to spend 30 minutes to an hour trying to install those large maps finding that your ActiveSync connection dies in the last minute of copying! This is a superb installation process and really cannot be flawed in any sense. It's a shame that other companies haven't chosen to implement this. It does add the cost of a storage card to the package, but these are coming down in price every week, so really shouldn't increase the overall price of the product by much. Okay, I now have the full system installed in less than a couple of minutes, this is impressive and I was raring to go, although I was deprived of my caffeine shot, however I think the install process made up for it by a long way and I think the caffeine would probably make me even more hyperactive! There are currently two hardware offerings available from TeamWarrior and Travroute in the UK. 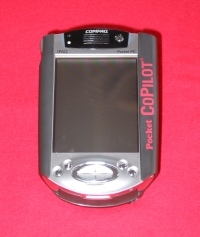 The first is the standard setup which gives you a Compact Flash GPS Receiver with an 128mb SD Storage Card which is primarily for use on a Compaq iPAQ 3800/3900 series Pocket PC, or any Pocket PC that will take both an SD and CF Card at once, and the second one is CoPilot have improved upon the original Navman sleeve offering and are now offering a new sleeve with an antenna angled at 45 degrees (or there abouts). This comes supplied with a CF card that will fit inside the new CoPilot sleeve. You'll see that both offerings come supplied with a power cable, a vent mount and a button with double sided sticky tape. This is to be stuck to your Pocket PC/jacket or the CoPilot sleeve. 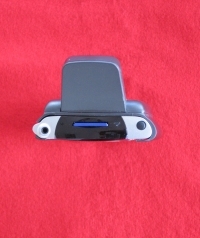 The air vent mount acts as a holster and you just slot your Pocket PC into this effortlessly. One thing that did concern us to start with is that many of us have gone through mobile phone holders with these button style holders and they usually break within a few days of heavy use, but so far the CoPilot button looks and feels as though it's made of very strong plastic, so hopefully this will not be an issue and we have tested this consistently over a 2 week period. Over the past year the Navman sleeve has become very popular amongst GPS users and GPS companies bundling it with their current software offerings. The Compact Flash GPS Receivers are fine, but if you have a Pocket PC and use a Compact Flash GPS Receiver, then you are limited by which storage mechanism you can use. 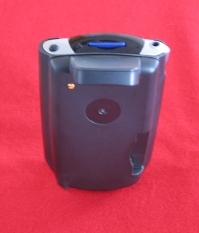 This is where the sleeve's work out better sometimes with iPAQ's because they have a CF Type II slot allowing for a storage card giving you the best of both worlds and enables you to use the GPS receiver in all conditions be it in the car, out walking and no cables required. Travroute like many wanted to improve their current performance and did this by bundling a modified EMTAC Sleeve. Emtac are the same manufacturers of the BlueTooth GPS Receiver due to be released shortly world-wide! Pocket PC users are now getting a great offering of different receives from in-car GPS mouse, CF Card GPS Receivers, Compaq iPAQ sleeves and BlueTooth GPS Receivers. This really is good for the Pocket PC GPS Market! So which do you prefer ? Do you prefer apples or oranges ? A closer look at the new CoPilot sleeve shows it to be very robust and well finished. No sharp or pointy edges and is a lot slimmer than the previous CoPilot (Navman) sleeve. You'll also notice a little metal socket top left on the rear of the sleeve, this is for the external antenna. Oh yes! You can plug an external antenna into this baby! At the bottom right of the sleeve is a DC socket to enable you to plug your charger cable directly into the sleeve, no need to mess around with that horrible 3800 iPAQ connector cable anymore! The sleeve also comes with an internal battery. Thought has really been put into this sleeve. Several Pocket GPS readers have commented that the sleeve looks ugly, and there have also been concern in the GPS user community that having an antenna stick out at this angle could be a problem if it were to fall and catch on something in-car. 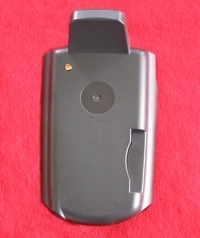 We can tell you that this antenna is rock solid, made of very tough plastic, and even if this were to drop, we would hedge our bets that the iPAQ would receive more damage than the sleeve antenna! The antenna may look obtrusive, but when you're walking with it, or have it in a case on your belt, it really doesn't feel obtrusive. It also doubles up as a good stand when you put the iPAQ onto your desk ;-). Seriously though, the sleeve design makes it as slim as a CF card sleeve, and doesn't skimp on any features! Travroute have made this a simple task. As soon as you load CoPilot you are asked for what it thinks is your next destination. If you only have two addresses that you've driven to, it will alternate between these, making it easier to say navigate from home to work and back again. 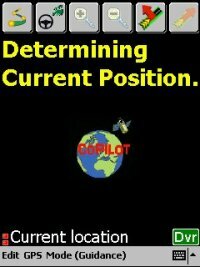 Once you click on Start Driving it will start determining your present location, looking for satellites at your current location. If the destination is incorrect, you can tap Edit Current Trip and select one of the other destinations you've driven to. If the location it thinks you are in is incorrect, you can also change this to hopefully speed up acquisition times. CoPilot 3.5UK contains all the essential routing options that most of the top packages contain. 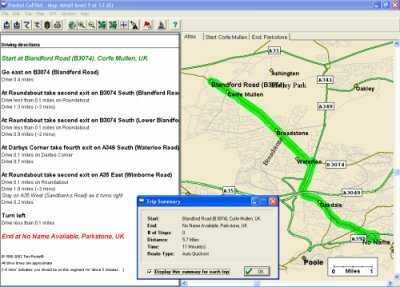 Like most Street Routing software for the Pocket PC, you have a Navigation screen which gives you all the information you require including the next turn, distance to turn, distance to end of journey, Estimated Time of Arrival, Street name to arrive at. You'll notice also it actually shows the full road names, not just designated A roads, which is a great benefit. 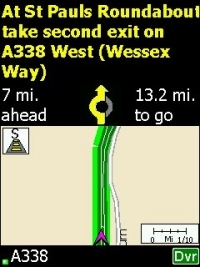 When driving along and getting close to the next turn, the navigation screen will split into two, the top half giving you the essential information you require for the next turn on your journey, and the bottom part of the screen will show your highlighted route in green, the direction you are travelling and which road you are currently on designated by the DVR. Although this map screen can be quite small, it's sometimes better to tap the top half of the screen then go out to the full size map screen like in fig 3. You'll also notice your position is designated by a pink chevron. 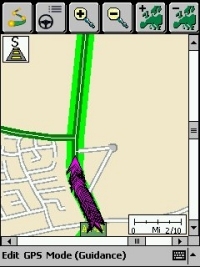 This moves and plots your course along the road showing where you are on the road. In fig 3 you'll notice at the top of these chevrons a pink circle. This is designated when you are stationary, for example at a roundabout or at traffic lights, so you always know exactly where you are. The chevrons can be a little off putting and clutter up the map, especially at lower zoom levels. Moving around the map is not as intuitive as other products like Navman SmartST Pro or TomTom Navigator, you actually have to use the scroll bars which can be kind of difficult when driving and would advise against attempting this. 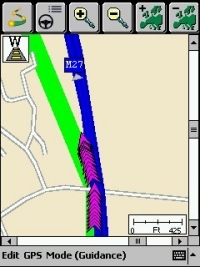 The highlighting of the route is a similar feature to what you see in AutoRoute on the PC, a better way to put it is a magic marker highlighting the route. It does seem to highlight the route by small blocks which allows for sharp turns in roads as you'll see in fig 4 but it also makes the route look a little jagged. This isn't a major issue, just a cosmetic one. You'll see both from fig 4 and fig 5 that the road can get pretty cluttered up with the driving position pointer. A page should be taken out of TomTom, Navman and Destinator's books and Travroute should really change this to a single chevron. 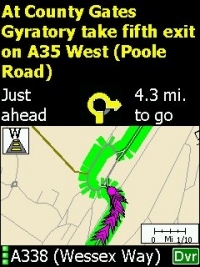 Multiple chevrons makes it easier to quickly pinpoint where you are on the screen, especially in bad sunlight, however just imaging if you were travelling down some of those small roads in fig 4 or fig 5, you would have to be zoomed in to a high level to see where you were driving. The maps do seem to be fairly up to date, certainly more up to date than the maps supplied for the Compaq iNS. 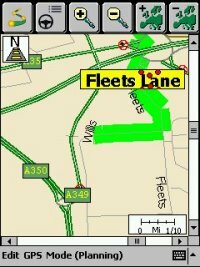 We didn't come across any map errors or impurities whilst testing CoPilot 3.5UK, however there probably are some out there judging by map problems found on other competitor products. The routing and re-routing is fairly accurate, we didn't find any problems where we were directed down strange routes, in fact, comparing it to TomTom, you would think Travroute were using similar routing algorithms. Travroute are using NavTech as their Geodata (map) provider. We noticed on several stretches of roads that suddenly the highlighted route would veer off at a tangent for some reason. No roads covered these areas which seemed strange. You can see this in Fig 7. This is probably down to the algorithm used, certainly routing was unaffected by these problems, although the positional pointer did seem to start to follow the newly highlighted journey, although when the screen updated/refreshed, it highlighted the correct route, so it was really just a cosmetic issue, and you weren't suddenly thrown onto a nearby road, so this may be a minor bug fix that can be applied to resolve this problem. Before anyone asks, we didn't go driving up or down any motorway embankments ;-). The CoPilot Options are full of features. 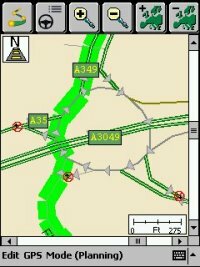 Like most GPS routing software for the Pocket PC, you can choose between the Quickest and Shortest Routes giving you optimum routing abilities. 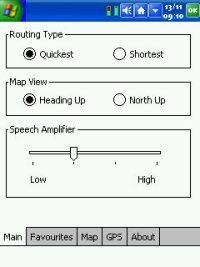 You can also change the amplification of the Voice Navigation, add and remove favourites, and list areas of data. Travroute have tried to keep the options screens as simple as possible. 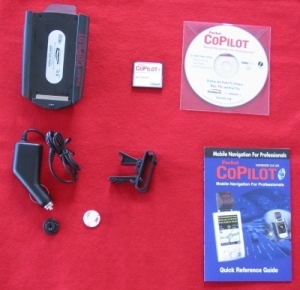 CoPilot like many GPS Applications gives you the option of using both User selectable COM Ports and Baud Rate settings, or to AutoDetect these. 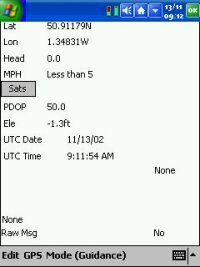 You also get a GPS Status screen that gives you most of what you will need to know in terms of Latitude and Longitude, Heading, Speed, PDOP, Elevation, UTC Date and time, and further satellite information. If you click on the SATS button you'll then see a full list of the 12 satellites it can currently see, and the S column shows how many you have a lock on. In the Map view, you can tap on any road name and it will display the full road name in big bold letters (as shown in the screenshot below), so if you have got lost and you've pulled over and want to quickly see the road names of surrounding roads, then this can come in very handy! You will also notice that roundabouts have arrows on them and no entry signs to some of the entrances showing you in which direction to travel. Strangely enough, people do drive the wrong way around roundabouts, and reverse up slip roads, some people are just completely mad! 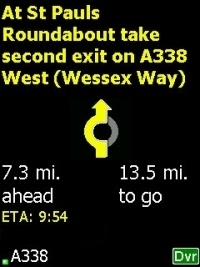 This feature will also help if you are in a foreign country and will help alleviate any fears you have of roundabouts. Also most dual carriageways when zoomed in will appear as two roads. This can be good from the point of view for routing, and determining which side of the road you are on. 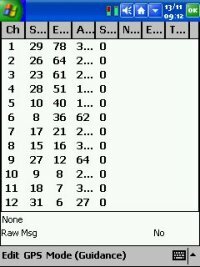 Instructions is a feature that is widely implemented in most Pocket PC GPS routing applications, but is rarely used. I think CoPilot have got this spot on. What you need on an instruction screen is exactly what the next turn is, how long in distance to the next turn, and which direction to make for the turn. CoPilot gives you all of this with an approximate turn arrow for each step of your journey. 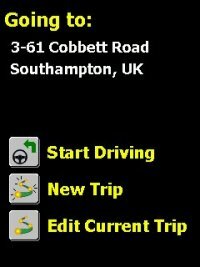 CoPilot also gives the the total journey time and distance which is always appreciated on instruction screens. Bundled on the CoPilot CD is a version of the software that you can run on the PC. 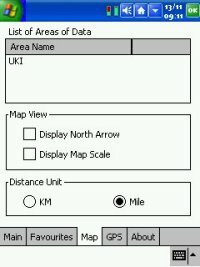 This isn't enabled for GPS use via the PC like the Pocket PC is, but you do get full UK maps and you can plot routes and export these as smaller maps to the pocket PC. The PC version gives you three options to select in transferring data to the Pocket PC. 1) You can export a City Radius which will allow you to download a specific area around a city of your choice to the Pocket PC. 2) You can export a Map Area, which although similar to the City Radius, it allows you to specify any manually selected area of the map to export to the Pocket PC. 3) The third and final option is to download data for your specific route. This has the extra benefit that you will only download a channel of where your route will take you across the map, saving storage space. By default CoPilot will select a 10 kilometre radius around all stops and a width of 10 kilometres on the corridor which connects the start and finish and any other stops together. The 10 Kilometre is a default, and can be changed within the the software if you feel that 10 Kilometres isn't enough. One of the best features by far is the Voice Navigation which is supplied to Travroute through an agreement with Fonix. Unlike Voice Navigation built into other GPS Navigation software, Copilot actually does speak out the road names rather than (Turn Left or Turn Right). This really does help when driving, and we found that we very rarely had to look at the screen. This makes it safer to drive with an in-car navigation system. CoPilot's Voice Navigation prompts you will hear are like "After 200 yards, turn right onto Ealing Road". Although the voice is synthesised, we thought it would be difficult to get used to, but after listening to CoPilot's Voice Navigation for a 15-20 minute period, we found ourselves well tuned into the way it speaks and only got caught off guard by the odd road name. The only downside to the Voice Navigation is that the volume although quite loud when travelling normal roads, could be louder for motorway driving. 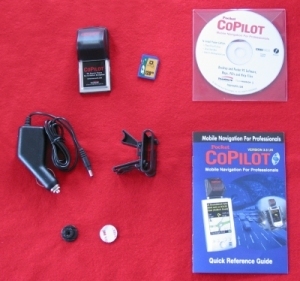 Copilot comes with two types of re-routing, the first is automatic re-routing which occurs when you fail to continue down the journey CoPilot has mapped out for you, and the second is manual re-routing in the form of a detour button. 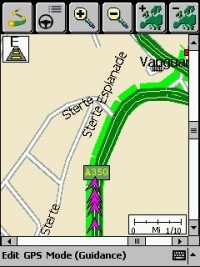 Unfortunately when testing CoPilot, we found ourselves in several very long traffic jams (through no fault of CoPilot, but due to excessive road works and accidents), and we found the detour button very handy, with a quick press of the detour button, CoPilot was off and giving us another route to take. This helped us out on numerous occasions and worked very well. If you don't like the new alternative route it's given you, you can press the detour \button again and it will take you back to the current route. 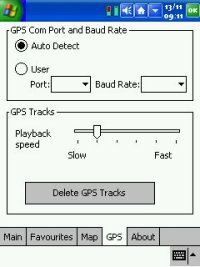 This is a feature that should be added to all GPS Navigation Software! 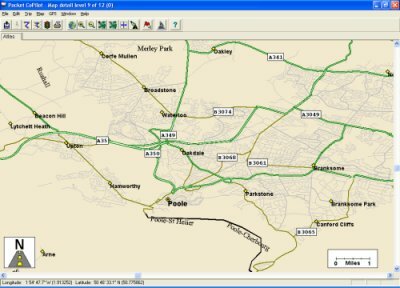 When plotting your destination, CoPilot really does excel here as CoPilot really is the only GPS Navigation software for the Pocket PC that allows you to pick a location by Post Code. This really does make sense, and is a very quick way of finding not only the street and city, but also which side of the road in most cases a building is located on. 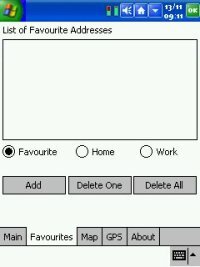 This really should be a default option for all Navigation software! 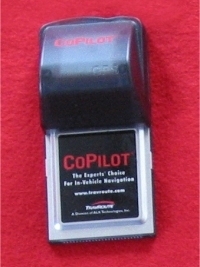 CoPilot will also allow you to set destinations via your Contacts database which is synced with Microsoft Outlook on your desktop Computer. This makes perfect sense, and is something that most GPS applications really should support, because if you're going to want to travel somewhere on business, the chances are it's listed in your contact database. 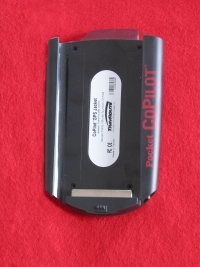 CoPilot from a hardware point of view is good, the CF card has decent enough Time To First Fix's which won't keep you standing around waiting in the cold or rain, the Sleeve also has a good TTFF's and is much better than the previous sleeve offering. 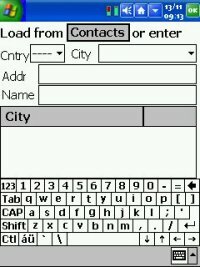 The software is very good, modelled on the original CoPilot software and the software that was supplied in the Compaq iNS (iPAQ Navigation System), and has been improved upon. 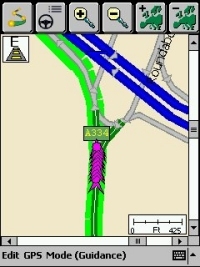 Roundabouts are correctly listed, exits on each roundabout are listed correctly and the maps appear newer. The Navigation screen has a wealth of knowledge that will keep most people happy, but when it goes into split screen mode with a map, the map level detail is difficult to travel with, and we found ourselves having to drop back into the Map screen if we wanted to rely on the map. This isn't a fault in the product, just from how much data you can cram into a half height screen. CoPilot will also allow you to set destinations via your Contacts database, which makes entering destinations a breeze! The Voice Navigation is superb, spelling out each and every road we needed to travel along, with exit numbers and directional turn information. It's going to be hard after the review period not having this information available as it really is a dream to use, and does make you rely on the screen much less than you usually would. The only downside with the Voice Navigation, even with the amplification set to high, it still could have been a little louder. This was mainly noticed in a very heavy rain storm and whilst driving along a noisy motorway.